Shopping for DC Comics Games? Play poker with the DC Comics supervillains! Set includes chips, dice, two decks of cards, and a dealer chip. Featuring the art of Kevin Nowlan. How's your poker face? It better be good if you're going up against these guys! 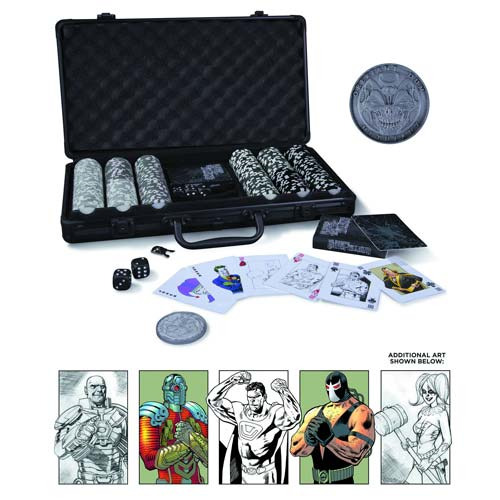 This DC Comics Super Villains Poker Set features the art of Kevin Nowlan and comes complete with chips, dice, two decks of cards, and a dealer chip - all in a beautiful carrying/storage case. Case measures approximately 15-inches long x 8-inches tall. Ages 14 and up.